It is nice to see a father with his daughter. Unless their union is like a rat drowning in water. Take the Ross' for example - they are both a random sample - of parentage that did not develop as it ought to. Don't believe me, then why don't you ask Writer: Jeff Parker; Artist: Elena Casagrande; and Publisher: Marvel Comics in February 2012. Conceptually, 'Red Sky at Morning' is a tale divisible by two, with an addition cliff-hanger slapped in at the end of it, or otherwise the writer would cry like a baby. Part One - The Problem With Gamma-Powered Daughters: Normally when a Daughter visits her Dad, she may want to give him a present of some kind - like a box of chocolates, an IPod, or a moustache grooming kit. 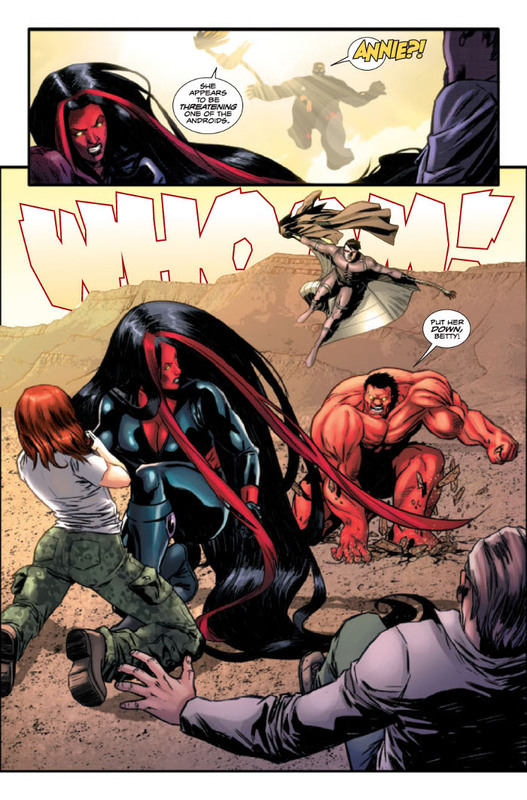 However, if the daughter in question is none other than Betty (Red She-Hulk) Ross, and the father is Thaddeus (Rulk) Ross, the only present that he can expect is a right, SLAP! A couple of, POWS! Whilst she generally annoys all the androids at Gamma Base around him - like Annie and Aaron for example. Still, Rulk tries his best to calm Betty down, just before she leaps off into the distance (maybe?). Part Two - Going off to Visit an Old Enemy: As soon as Betty leaves (or does she?) Annie gives Rulk and Machine Man their next mission - track down, confront, and then apprehend Zero / One, because she has killed a lot of people and is forming an army of her own. So prudently, this demilitarised duo gets onto a ship, navigated by Annie (stowed away by Betty), and eventually catches up to this technological threat. Unfortunately, though, Zero / One is prepared for them - and in more ways than one. The Question - Will Rulk and Machine Man be able to take on Black Fog and some mutated sea creatures, to get to Zero / One? 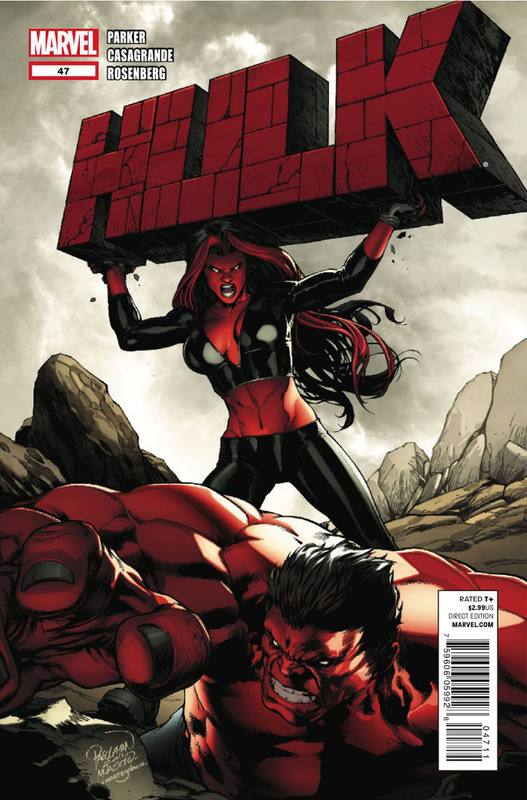 I liked the hesitation in Rulk's voice when he spoke to Red She-Hulk, saying to her "Are you going to let me talk to B... you? As Betty?". That slight flinch showed the man inside that monster, right? Now I have to be honest with you, I thought that this story was fairly fine overall. Granted, it did feel blatantly like story of two half's - the first of which was a confrontation that did not resolve itself - and the second of which was a set up to next issue. Still, in retrospect, it was a nice read - and I am looking forward to what's coming up next. Personally speaking, I thought that the artist, Elena Casagrande, did a rather pleasant job on this comic book. Nothing outstanding mind you - but the layout were easy to follow, and the character's expressions where well illustrated. Moreover, I did enjoy the artistic styling's of the 'briefing section' - particularly the 'parchment look' - very innovative. Though, I do have one slight niggle with her artwork - and that would be Elena's female illustrations do feel more complete than her male illustrations - especially in the compositions. I was happy to see Machine Man in this issue, as well as a story line where we can finally get to see father and daughter hashing it out 'super hero style'. Well, it was bound to happen sooner or later, right? So it might as well be on a book that needs someplace to go with character back-story and personal-mythology. I was not too keen how Betty just jumped out of the sky and started punching people for no apparent reason what so ever. OK, I understand that this is in her 'nature' now. But still, maybe this could have been done in a less overt and 'play it by the numbers' manner. I did have the strange compulsion to urge Rulk to scream at his daughter 'CLEAN UP YOUR ROOM' - even if the sand outside is very clean. Kelly and Ozzy Osbourne performed a song together a couple of years ago called 'Changes '. Aesthetically, this tune is about how a father and a daughters relationship 'changes' over time. I would have loved for the real Hulk to suddenly turn up, and then start to bash the ka-ka out of the cleaner of Gamma Base, because he does such a nice job of cleaning it up - especially the sand. At the moment, the only thing that is rolling round in my head, is the thought that a tiny little mouse is out in the desert somewhere, cleaning the sand with a toothbrush - one speck at a time. Poor little mouse - I blame Walt Disney myself - as well as toothbrush manufactures. As for the Rulk on the other hand - well - he's doing OK, huh? Even if I have an inkling that something big is looming on the horizon - something that might give this series some overall clarification.